TOKYO — The voice was slightly halting, childlike. “Welcome to Miraikan, Mr. President, it is a pleasure to meet you.” President Barack Obama bowed, looking delighted. “Asimo” stands for Advanced Step in Innovative Mobility. His greeter, after all, was a 55-inch-tall, give or take, humanoid robot with the look of a diminutive Star Wars storm trooper. “It’s nice to meet you, too,” Obama said, pausing to watch the robot, named ASIMO, perform during a tour of the National Museum of Emerging Science and Innovation. Despite Obama’s background in constitutional law, there’s a presidential geek side that always seems charmed, if not bemused, by technological advances. The robot delivered a well-aimed ball at Obama who trapped it neatly with his foot. For its final demonstration, the robot declared, “Recently I have learned how to jump.” It then proceeded to hop, first on one foot, then on two. 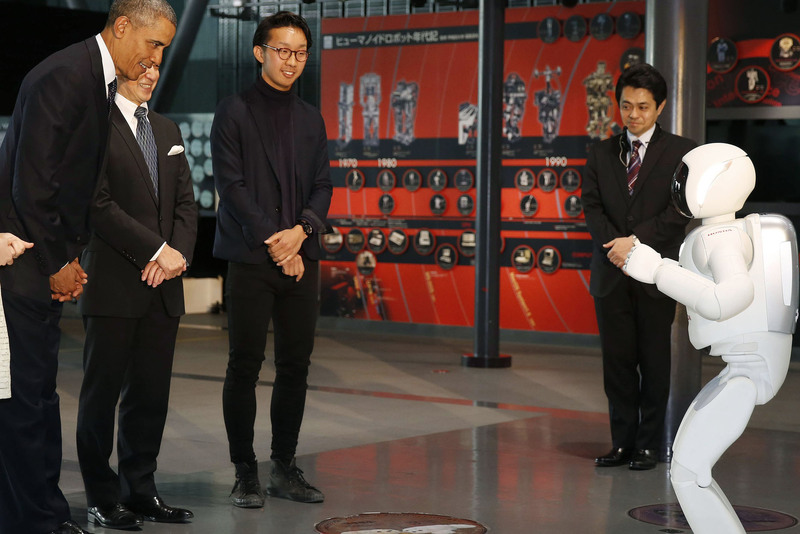 Curious, Obama asked Mamoru Mohri, chief executive director of Miraikan, whether the robot was remote controlled. Yes, Mohri replied, but the robot can act autonomously, too. Obama also witnessed demonstrations by other robots, including one designed by Japanese technicians and partially financed by the US Defense Advanced Research Projects Agency that was developed to help with disaster response. * Thanks to the NY Post for its reporting on this story.